Thank you for offering such a great program for children, my son has thoroughly enjoyed his experiences at Slow Clay Club for Kids. The environment is beautiful in every way. His teacher Louise really inspired his imagination by discussing his ideas in detail and showing him how to make them a reality, achieving a delicate balance between creativity and practical techniques. His creations have been way beyond my expectations and he is so proud of his work! I have been a student at slow clay for over two years. I have loved every minute of my time in the studio and with the different teachers, whose diverse backgrounds bring so much to their teaching. Not just in teaching but also informing us on the fascinating history of ceramics. After two and a half years I still look forward to my next class as soon as the last is over. I feel at home when I am making and yet in every class I learn something new! The Slow Clay Centre is a hive of ceramic industry. An array of courses await you here taught by teachers at the top of their trade. 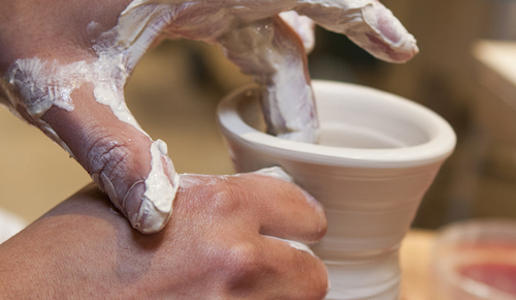 The wheel is addictive, hand building so exciting, the porcelain course an astonishment. Do them all or just one. It’s hard not to keep coming back. The workshops will spur you to greater things – the lessons will embrace and absorb you. I took Jane’s wheel throwing class all of last year, once I started I couldn’t stop! I’ve just begun Form and Surface to explore some new possibilities and love that too! I love the sense of community at Slow Clay, there is something so pleasurable about creating alongside others. I was seeking an opportunity to be creative again. I hadn’t realised how much I’d missed making things with my hands, and getting messy! I didn’t expect to make such strong friendships. And I never realised clay would be so addictive. I am constantly thankful that my first experience with clay with at Slow Clay. I took both the wheel throwing and form and surface classes for four terms, and subsequently spent a year at the National Art School studying ceramics, and pursuing my newfound love independently. The level of understanding, skill, and sensitivity that I experienced from the teachers blew me away, and what I learned there has continued to shape the way I think about clay, art, and life. I have been attending classes at SCC for two years now and participated in Wheel throwing classes, Form and Surface ( hand building), Decoration Sampler and Advanced Wheel Throwing. Some of the things I love about the Slow Clay Centre are the friendly and relaxed atmosphere and sense of community at the Centre; the excellent teachers; attention to all aspects of health and safety,I have issues with my hands and wrists and chose the SCC because of their reputation for safe practice, the Japanese style of throwing on a wheel which is better for me than the way I was taught elsewhere many years ago; but most of all it’s the joy I feel in my heart when my hands are in the mud, and while creating! I took the Monday evening wheel throwing classes for more than six years. I wanted to be able to learn new skills and create something that is practical and beautiful. I was always interested in pottery but the most important element in the classes was Jane’s teaching and her enthusiasm. An unexpected surprise was that everyone has a style that is manifested right from the beginning.